View of the Jami Masjid, Fatehpur Sikri, from the Archaeological Survey of India Collections, photographed by Edmund William Smith in 1893. The palace-city complex at Fatehpur Sikri was built by the Mughal Emperor Akbar (r.1556-1605); the Jami Masjid was completed in 1572. Akbar built his city close to the saint Shaikh Salim Chisti's refuge, after the saint had successfully predicted the birth of the Emperor's heir, Prince Salim. later Emperor Jahangir. The saint's white marble tomb, a fine example of marble decoration, is situated in the Jami Masjid's courtyard. 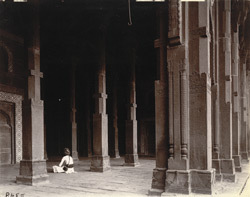 This is a view of a row of columns, modelled on a Hindu design, in front of the southern aisle of the liwan.